Installing our signature deployment software will take approximately the same amount of time as installing your signature manually. The benefit is that going forward you will never have to install your signature again - the process will be entirely automated. Click to proceed. Note: These instructions are easier than they appear. Follow them step-by-step and you’ll be done in 2 or 3 minutes. You should see your download dialog box (similar to this) - choose “SAVE” or “SAVE FILE” and click OK.
Navigate to the folder where you just saved the signature ZIP file - most likely this will be your “Downloads” folder. 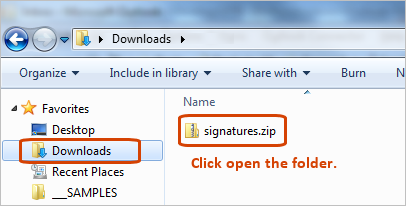 Double click on the “signatures.zip” folder to open it. Double click the folder that’s named like your email address to open it. 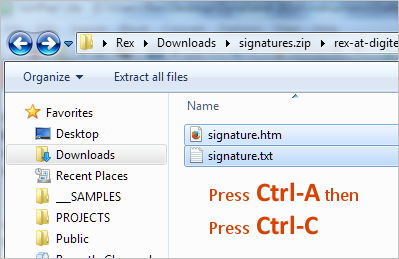 You’ll now see two or more files named “signature” (and possibly “reply- signature” as well). If you see “reply-signature” in the folder, make a mental note of it. 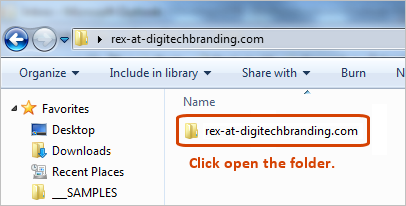 Then highlight the address in Windows Explorer. You’ll be in the folder where Outlook stores its signatures. Click the BACK ARROW button in Windows Explorer. Press your “Ctrl” key and your “A” key at the same time - Ctrl-A - to “select-all”. All the files will now be highlighted in blue - press your “Ctrl” key and your “C” key at the same time - Ctrl-C - to copy them. Click the FORWARD ARROW button in Windows Explorer. You’ll now be back in your “signatures” folder. PASTE the files here (copy & replace the old ones if prompted). You can now close Windows Explorer if you wish. Step 2. You’ll now see the signature you just saved in your list of existing signatures. Set this signature as your default signature for new messages and for replies, save your settings and exit the signature dialog by clicking “OK”. 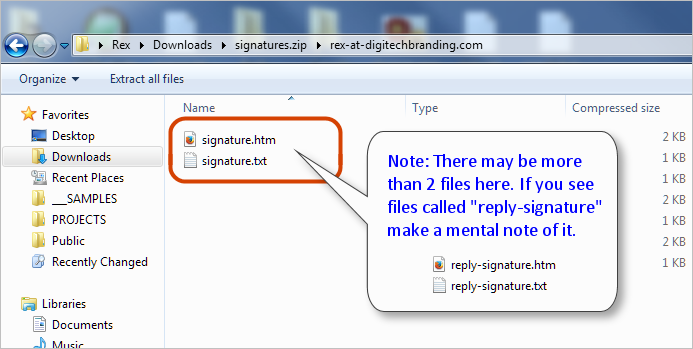 Note: If you noticed a signature in your zip file download called “reply- signature” set it for replies (instead of just “signature). 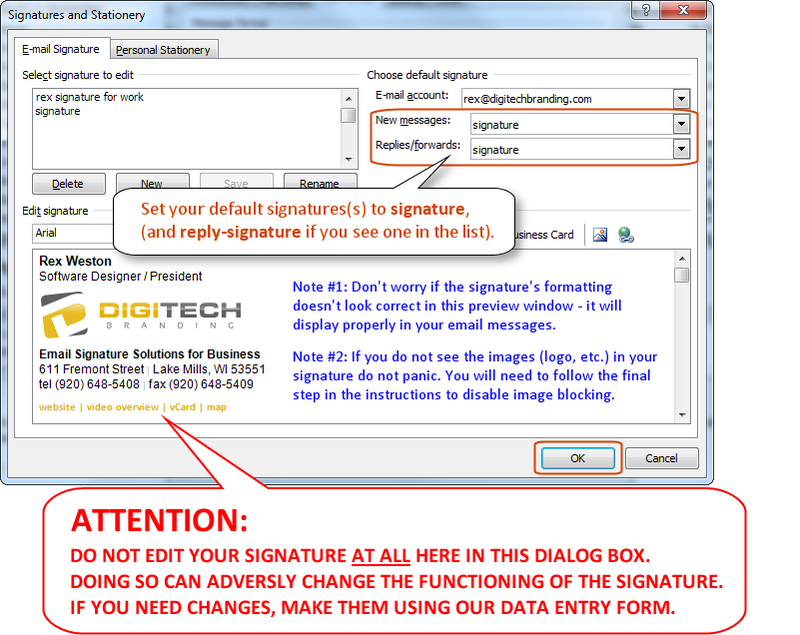 ATTENTION: Do not edit your signature AT ALL in Outlook’s signature editor. Doing so will change the fundamental way that Outlook treats the graphics in your signature, and may result in a poor display of images (blurry and maybe also enlarged). If you need to make changes to your signature, do so using the data entry form set up for your email signature program and then reinstall your signature from scratch. You’re now finished installing your signature - it should appear properly for new messages and replies. Note: If you are not seeing the images in your signature, refer to the section below on disabling image blocking. If the graphic images (logo, social media icons, etc.) do not show up in your signature, it is most likely that you have a setting in Outlook called “Don’t Download Pictures from the Internet” (commonly referred to as “image blocking”) turned on. You can disable image blocking by following these instructions. If you have questions about how your signature is functioning, refer to our email signature FAQ’s.